Please watch this short video for an introduction to how Deadline Funnel works! The goal of this article is to give you a basic understanding of how setting up your first Deadline Funnel Campaign works. We’ve broken this up into 5 easy steps. Follow these 5 steps and you’ll get your first Deadline Funnel Campaign up and running in no time. This is a handy tool we created for easy reference when you're setting up your campaign. Which tasks are included in your Quick Start Guide depend on a few factors. Whether it’s a Fixed Date or Evergreen/Hybrid, what trigger you chose, etc. Under each task there is always a Help button and a Setup button. The Help button will take you to our article on how to integrate with your specific platform(s), and the Setup button will take you to the section of the admin where the actual setup happens. You can find your Quick Start Guide at the top of the left hand menu under Edit Your Campaign. The purpose of the trigger is to establish a starting point for each subscriber’s unique deadline, so this part only applies if you are setting up an Evergreen or Hybrid deadline. There’s no tracking involved in a Fixed Date deadline, as the deadline is the same for everyone based on a fixed calendar date, so if you’re setting up a Fixed Date deadline, you can skip this part. You can see in this example that we chose the API Integration. If you click on the API Integration box, you’ll see a page with a Help and Setup button. 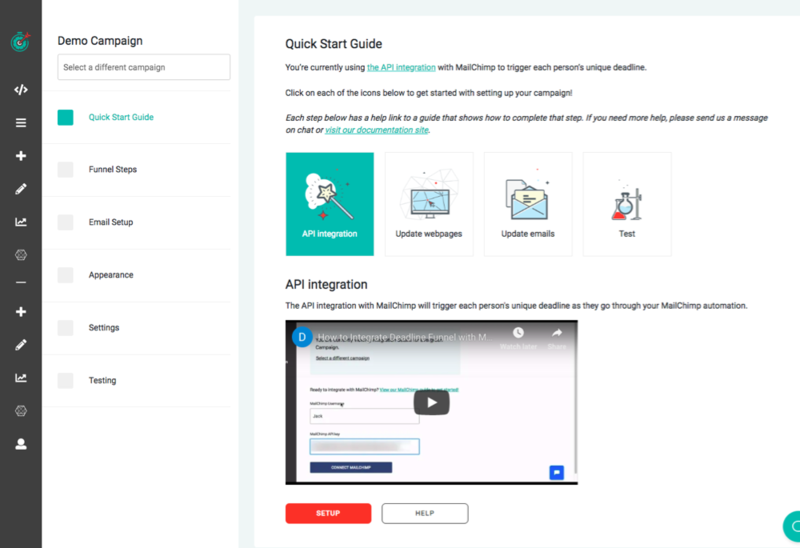 Click on the Help button to go the our article on how to set up the API Integration with your specific Email Provider, and click the Setup button to be taken to the API Integrations tab. If you select an Optin Trigger, you will see a box for the Optin Form Integration instead, or a Page Trigger will just have Update Webpages and Test. How you add the timer to your page(s) varies depending on the platform you’re using. 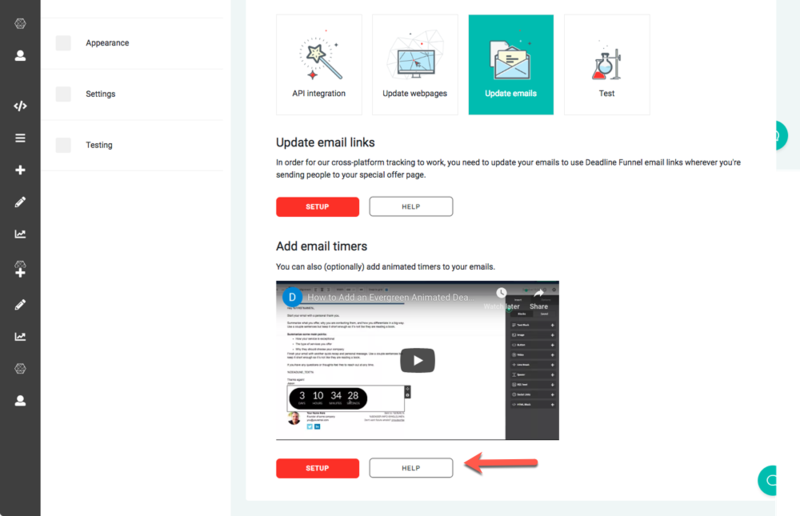 Navigate to the Update Webpages box in the Quick Start Guide and click on the Help button to go to our article on how to add your Deadline Funnel timer to the specific platform that you’re using. When this step is complete, you should be able to see the Deadline Funnel timer on your special offer page. If you're using a Page trigger, then you're all set! You can skip forward to Testing your funnel. Email Links - Each Funnel Step in your campaign has a corresponding Email Link under the Email Setup tab. These links are used for tracking subscribers across multiple devices, and they're a key component in using the deadline with your emails. Check out our full article on how to use Email Links here. You can also find links to these in your Quick Start Guide under the Test box. And that's it! You should be all set to go! You can also shoot us an email at help@deadlinefunnel.com.